IT’s been much too long that I’ve written anything. And, I won’t say too much at this moment. The only thing IS this… “Big” Business is exacting a toll on those of US that ARE compelled to do the JOB TASK WELL. I was fired by a janitorial company AFTER the day’s “supervisor” had “almost” committed ANOTHER CONTAMINATION BREECH! On top of such said one “in charge” promptly THREATENED my ‘life’ where I left the site… which is where much of the world’s food products ARE TESTED. BUT, I was fired. All in all the fact that most of those that ARE CAPABLE are shunted away from “the right thing”. To add insult to INJURY, when these entities are contacted as to the “worthiness” of one’s being a candidate for employment by another they WILL CONSTRUCT the “believably” heinous story they can to thwart “correct”. THE FACT of AGING contributes an aroma of maturity that is unpleasant to the H.R. heads. Being an “old, handicapped” guy isn’t what OBAMACARE supports. I wonder what FARFAL would say? STOP PAYING YOUR BILLS VIA YOUR BANK ACCOUNT!!!!!!!!!! Long story, short. For the time period that I HAVE been trying to get the newly built CONSUMER FINANCIAL “PROTECTION” BUREAU to do the proper thing about this, ( AT&T is STILL having collection agencies contacting me about the STOLEN monies, ($63.00). After several calls the last was CUT OFF during the point of conversation that I was telling the agent that I WAS going to a “news” agency with my story. I have written about this since it happened first. Now, Columbus, Ohio native RICHARD CORDRAY is sitting comfy in an office that has used the definitions of “ABILITY” to NOT “PROTECT” the citizenry. As I write this I KNOW that my “Uncle” has a nefarious vein of collussional vindictiveness being stoked by something that “thinks” that it’s ‘HUMAN’. The “seen” premise is this… A business extracts MILLIONS of people’s/ customer’s ‘agreed on’ sum of ‘payment of use” but do so MORE than the set moment of terms. Placing these “TRILLIONS” of Dollars into a SHORT TERM ACCOUNT, ( at a very HIGH EARNINGS RATE. ), netting them an EXTRA “BONE-US” of their ‘return-on-investment’ while the customer has NO IDEA that this has taken place… and the BANKS AREN’T going to give up their new “HOLD-SCHEME”. Since the plan increases THEIR PROFITS just as well. You may think that this post is a “GRIMM” tale of an angry / inept mind… BUT, look around to ALL the “improbable” actions that the SCOTUS enabled have been doing. SO FAR. (check your account often. Look at WHO is /HAS been doing whatever… “while YOU WERE SLEEPING. The WORLD has gotten so crazy that I HAD forgotten that THIS IS EASTER. The “work-a-day” world has taken me from ‘reality’. But, as the increase of people has wounded the Earth terribly there had to be a stopping point. That would be my being told that there would be NO WORK on THIS SUNDAY. And, I truly believe that the creator HAS had their fill of STUPID, of which I’ve added my TOO FAIR SHARE so would place this “appeal”. As this site IS my initiate of “thought” to presentation I scatter my gleanings of lessons of the “meaning” of the day called EASTER. As, TOO MANY TIMES before the “mindset” of the self glorifying IS DISRUPTING ‘neighbors’ NEAR and FAR. After ALL the years of “recoveries”, rebuilds and “education(s)” the FACT that we would BE PART OF ANOTHER group of ARMED STUPIDITIES just goes to show how much insignificance WE have remained… For ALL the gifts of “IMPROVEMENT”. 304071004579407992832670628.html), through making pathways less “closed”. But, what of those that HAVE / ARE suffering by the desperations of the past? I believe that a DILIGENCE of bringing recognition to the OVERLOOKED antics of EMPLOYERS that HAVE used the the vagueness of WHAT “AT-WILL” allows. The SUMMIT of such a thought’s success is what I’ve been constructing for FORTY-THREE YEARS… From non-graduation information to TAX data. I WILL have the “SAY”, and NOT ONLY HERE. This site IS where I began the FREEDOM, ( AND, RESPONSIBILITIES. ), of HAVING MY SAY began. I hope that this practice HAS achieved “A” maturation. A blue sky law is a state law in the United States that regulates the offering and sale of securities to protect the public from fraud. The fact that EVERY PARENT attempts to bring SECURITY to their offspring, health,hearth, honorariums IS the why that “WE, THE PEOPLE” have done what we have to get HERE. To continue to allow the “crooks” to prosper IS against any “FAITH” of the “righteousness” of living a GOOD LIFE. 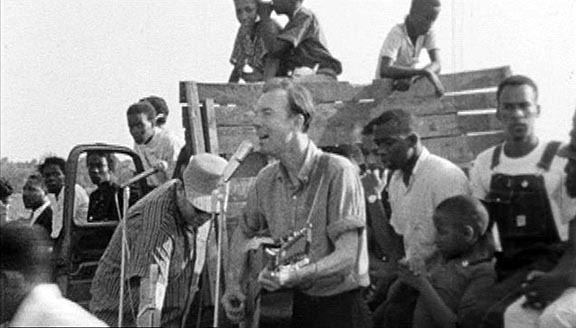 [PETE SEEGER} WAS “there” when most of this nation was a wishing for “better”. The witness to too many pieces of the the ugly puzzle that IS the political “foundation” of what we ARE juggling today. I have no vast wisdom of this Man that played a banjo but, didn’t yodel. HIS music has been the TONE of too many areas of the ‘life’ I’ve traveled through. [Mr.SEEGER] didn’t say ANY MORE than was necessary… though HE SANG a LIBRARY of the WORLD’S EVENTS and PEOPLE. The “world” IS getting CRAZIER.